By Michael Learmonth . Published on April 28, 2013. 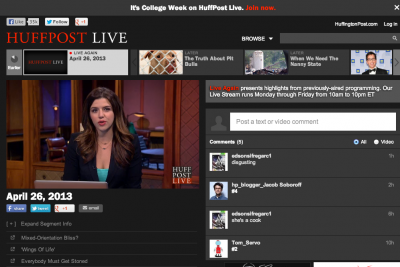 AOL's live web news program, HuffPost Live, is getting a shot on TV. The network, which broadcasts 12 live hours a day, will become core daytime programming for AXS TV, the cable network formed from a joint venture among Mark Cuban, Ryan Seacrest, talent agency CAA and event promoter AEG Entertainment. Starting May 13, AXS TV, once known as HDNet, will carry six hours of programming from HuffPost Live from 10 a.m. until 4 p.m., replacing a hodgepodge of concerts, shows like "Nothing But Trailers" and repeats of Dan Rather Reports, the news program that was the signature show on the network. The feed provided to AXS TV won't be the same as the one that "airs" on the web, but it will be similar brew of talk about storylines drawn from The Huffington Post's 80 content verticals from lifestyle to crime. AXS TV is still thinly distributed on cable and satellite, in 41 million homes out of roughly 100 million cable and satellite TV households across the country. Still, it will be Aol's first beachhead on the tube and part of the blurring of the lines that's taking place between traditional cable TV and web programming which is increasing distribution through applications on web-connected TVs and set-top boxes. 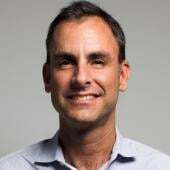 "We are trying to build a network that will be the next-generation news network," said Roy Sekoff, a founding editor of Huffington Post and now president of HuffPost Live. "We want it to be seen by as many people as possible on as many screens as possible." The deal gives AXS TV some signature programming for the latest iteration of the network, now focused on live TV. Back when Mr. Cuban founded HDNet, the premise was providing still-scarce high-definition programming as consumers snapped up high-def TVs. But after more than a decade, the channel was still only in 27 million households. A year ago, Mr. Cuban joined with new partners and last summer relaunched the network as AXS TV, with a focus on live programming; concerts, events, and, now, news. "One of our tag lines is 'by the time you see it on YouTube, you have already missed it,'" Mr. Cuban said, in an email interview. "Live programming has a unique quality in that anyone who is passionate about the artist, team or topic not only wants to see it, they want to see it as the same time as other fans and talk to them via social media, text or email." The deal will be touted on Tuesday as part of AOL's "NewFront" presentation for advertisers and agencies, along with a new slate of programming. The deal came from a meeting between AOL CEO Tim Armstrong and the billionaire owner of the Dallas Mavericks. After that initial meeting, Mr. Cuban joined a conference call with Mr. Sekoff, Arianna Huffington and other executives. Mr. Sekoff said Mr. Cuban bought the idea on the line. "When can we test the feed," he asked. "How about tomorrow?" Mr. Sekoff said. HuffPost Live is less news than video talk radio. "We don't really do breaking news, we do breaking conversation," Mr. Sekoff said. On Friday afternoon, for example, HuffPost Live host Jacob Soboroff hosted a conversation with TLC's "The Little Couple," Bill Klein and Dr. Jennifer Arnold, about comments Rosie O'Donnell had made about little people. Interviews are conducted mostly via Google Hangouts. Running Twitter commentary streams down the right side of the page, a feature Mr. Sekoff said AXS TV will bring to the TV show. Mr. Sekoff described the arrangement as a licensing deal, but declined to give specifics. The show had 51 million views across AOL's network in March; it has topped out at 40,000 concurrent views, according to AOL's internal numbers. Mr. Cuban will also bring TV ads to HuffPo Live. On the web, the show is monetized with short 5-second bumpers when a stream is initialized and some product integrations, but no traditional ad breaks. Archived segments have pre-roll ads. On TV, HuffPo Live will get four three-minute ad breaks per hour. Daytime TV on a niche network isn't exactly primetime, but Mr. Cuban said there's a significant audience at home during the day. "If you are work or out of the home during the day, online is great," he said. "If you are at home during the day, tv is the primary media device." While its HuffPost Live's first cable deal, the network is available through apps on Roku, Boxee, Samsung and Sony TVs and Google TV.